January 14, 2019. The Securities and Exchange Commission’s Enforcement and Investor Protection Department reiterated its advisory against Paysbook, which the government agency has found out to have changed its type of business but still continued with a similar type of operation from before. The Commission has found out that Paysbook has changed its type of business – from a “partnership” to a “corporation”. In its registration, Paysbook said the purpose of the company is to engage in the businesses of e-commerce system services, online selling, website development, among others. With that, SEC reiterates Paysbook is still not authorized to solicit investments from the public because it did not secure prior registration or even applied for any secondary license as required by the country’s Securities Regulation Code (SRC). A company needs to acquire necessary licenses before it can be allowed to secure investments from the general public. In the case of investments by way of initial coin offerings, while proper rules are not yet in place, SEC released updated draft rules that will govern the said activity in accordance with the SRC. The 37-page draft rules have updates ranging from the definition "blockchain", clarification on escrow agents, and what constitutes a startup. The Commission also revealed that people affiliated with Paysbook have been sharing photos on social media where Paysbook officers are within the Commission’s premises, which the government agency said is implying that the embattled corporation’s issue with the Commission has been settled. A photo of Paysbook’s certificate of incorporation is also being circulated on social media, which the Commission thinks is being used as a proof of the company’s legitimacy. With that, the Commission concludes that its 2018 Advisory concerning Paysbook is still in effect and that it does not find grounds to lift it as of yet. This is despite Paysbook’s change in its type of business – from “partnership” to “corporation” – as the SEC thinks the change in business type is just a “mere continuation and extension of the actual operations” of the company. Writing for a newspaper column, the former SEC president elaborates the reasons why the Krops ICO can be regarded as a sale of securities. In a previous post in BitPinas, the SEC has gathered reports that Paysbook is offering online investments and enticing users to invest in a cryptocurrency called Indigen Coin. Members are set to earn money by logging and logging out while also recruiting other individuals in the scheme. Members are also set to earn Indigen Coins when they like, share, and comment on the Paysbook social media account. SEC also said it will hold anyone who acts as salesman, broker, dealer or agent of these companies criminally liable, prosecuted and penalized with a maximum fine of 5 million pesos or 21 years of imprisonment. The Securities and Exchange Commission issued new comments as to how to deal with Initial Coin Offerings in the future. The Philippines' Securities and Exchange Commission has issued an advisory against a bitcoin investment scheme running in the country. 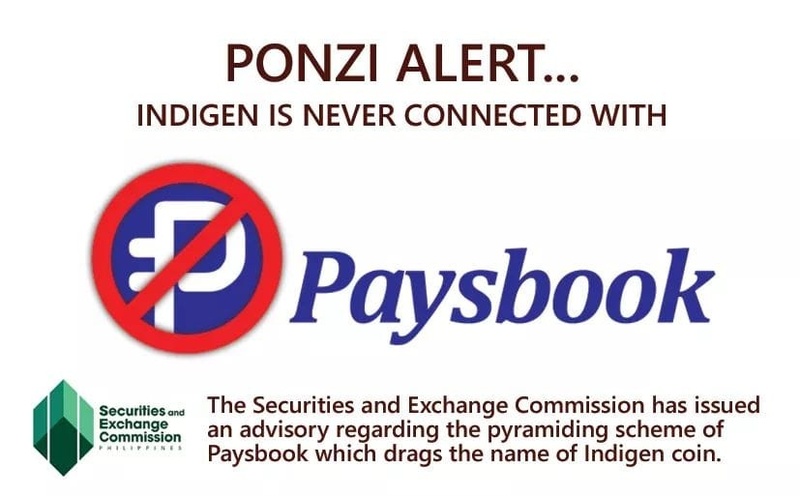 The Securities and Exchange Commission of the Philippines has issued a brand new warning dated January 9, 2019 (See http://www.sec.gov.ph/public-information-2/investors-education-and-information/advisories-and-notices/) against Paysbook who allegedly operating a ponzi or pyramiding scheme. Unfortunately SEC mentioned that Paysbook rewards its users with IDG coins (see page 2 item 4d). Please be informed that Indigen Asia Limited HK has stopped issuing IDG to Paysbook several months now when they were first issued a warning by SEC, AND IT HAS COME TO OUR ATTENTION THAT THERE ARE STILL PAYSBOOK MEMBERS USING IDG TO RECRUIT NEW MEMBERS saying they will get IDG coins as rewards for using their social media. 1. Paysbook is a separate entity registered in the Philippines and is NOT in anyway connected with Indigen Asia Limited, the developer of Indigen coin, registered in Hong Kong. 2. Similar to Bitcoin, due to the decentralized nature of cryptocurrencies, Indigen may be used by any person or entity whatsoever and the developers of Bitcoin, Indigen, etc have no control in this matter. We have communicated with SEC to remove the statement that implicates Indigen and we are hoping for their understanding and kind consideration.